Hidden away in hell, Wu-Feng has forgotten nothing. His incessant search allowed him to locate the receptacle. The shadow of his former incarnation already extends to the villagers, who are unaware of the threat. Fortunately, the Fat-Si (Taoist priests) keep watch, guarding the border between the dead and the living. Armed with their courage, their faith, and their powers, they are dedicated to send the reincarnation of Wu-Feng back to Hell. 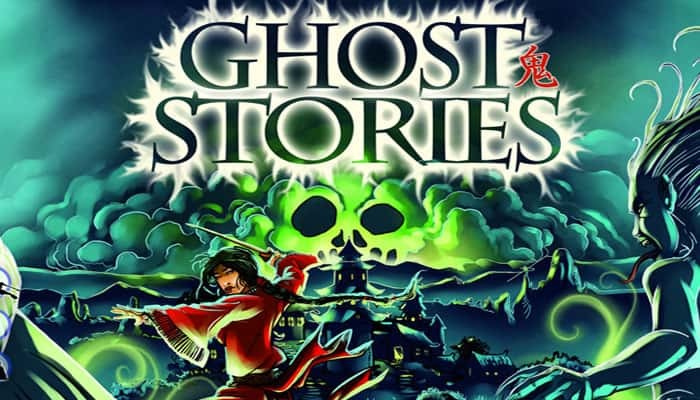 Ghost Stories is a cooperative game. Players play as a team against the game. Either they share a common victory, or they all suffer the same defeat. For your first reading of the rules, keep the play aids nearby: they will help you to understand the game mechanisms. The village that must be defended by the Taoists is made up of 9 locations, represented by the Village tiles. These sites can provide aid to the players, but may also be haunted by the ghosts. The front of each tile represents the place with its owner (called an active site); the back represents the place without its owner (called a haunted site). The Village tiles are detailed in one of the play aids. Each of the 4 game boards shows 3 rectangular spaces to harbor the ghosts that are attacking the village, 6 circular icons or stones (2 in front of each of the 3 ghost spaces) for the Haunting figurines, 3 for the Buddha figurines, as well as a symbol in the lower-left corner that depicts the corresponding Taoist's power. These boards are double-sided, each side providing a different power to broaden game pleasure. The Qi (pronounced "Chee") points represent the vital energy of the Taoists. They may be lost (under the assault of the Ghosts, and in few other cases) and regained (through rewards and a specific Village tile). A Taoist may possess more Qi points than at the beginning of the game, limited to the number of Qi tokens in the supply. Each Taoist has one Yin-Yang token that can be spent to perform a special action. This token can be regained during the gameplay thanks to given ghosts. 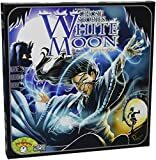 In order to fight the ghosts, the Taoists will rely on mystical components, such as sticky rice (yellow), silver bells (green), incense sticks (red), Taoist mirrors (blue), and coins (black), all represented by Tao tokens. These tokens exist in 5 colors, each corresponding to one type of ghost. The Taoists use the 3 Tao dice to exorcise the ghosts. An extra Tao die (grey) is associated with a specific power of the green Taoist.. Occasionally, the players must roll another die, the Curse Die, and suffer its negative effects. The ghosts are characterized by Color 1, Resistance 2, Abilities 3, and sometimes a Reward 4. These concepts are detailed later in the rules and in one of the play aids. the abilities in the left stone must be applied when the ghost enters the game. the abilities in the central stone must be applied each turn (Yin phase). the abilities in the right stone must be applied when the ghost is exorcised (see Curse and Reward). If a ghost has several abilities, they are applied from left to right. Example: a Haunt one tile upon arrival, b haunt one tile each turn, c haunt one tile when exorcised. When a ghost is discarded, its abilities are no longer applicable. Example: Bruce exorcised Severed Heads, so the group recovers the Tao die that the ghost had captured. Wu-Feng appears during the game as an incarnation (there can be more than one in upper difficulty levels). Ten incarnations are possible. They are depicted on the red back cards, being also recognized by the Wu-Feng symbol below the resistance. Each incarnation is characterized by its own capacities, as explained later. The Haunting figurines represent the Ghosts' menace to the village, and the Buddha figurines represent the mystical traps that the Taoists can set. Randomly arrange the 9 Village tiles to form a 3 x 3 square. At the beginning of the game, no locations are haunted, so the villagers are visible. Place the 4 game boards along the sides of the square of Village tiles so that each one faces a player. Randomly assign each player a color, and for each player, randomly determine which side of his board to use. Each player takes 4 Qi Tokens, the Yin-Yang token in his color, a Tao token in his color, a black Tao token, and places the Taoist figurine of his color on the central tile of the village. Place the 2 Buddha figurines on the "Buddhist Temple" Village tile. The remaining material (Tao tokens, Qi tokens, figurines) constitutes the supply. Take one among the 10 Wu-Feng cards at random, without looking at the cards. -Shuffle the Ghost cards. 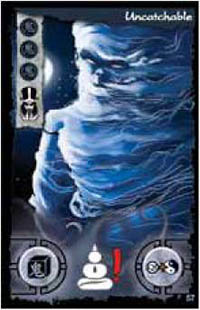 Therefore, the deck is sequentially constituted as follows: 45 Ghost cards, 1 WuFeng incarnation card, and 10 Ghost cards. In order to claim victory over the ghosts and save the village, the players must exorcise the incarnation of Wu-Feng. A player starts, the one who has seen most recently a kung-fu movie. The players play in turn, clockwise. Each player's turn consists of 2 phases (Yin and Yang). The diagram on the last page of these rules illustrates a player's turn. At the beginning of his turn, the active player announces the ghosts present on his board. All their central stone abilities are now applied in the Yin phase. For each haunting ghost present on his board, the player must update the position of the associated Haunting figurine. Three positions are possible: one on the card and two on the board. On the card: if the haunting figurine stands on the card, the player moves it onto the corresponding haunting icon on the board. Nothing else happens. On the board: If the figurine is already on the first haunting icon of the board, it is then moved onto the haunted tile icon at the edge of the board, and the corresponding tile becomes haunted. The haunting figurine is immediately placed back onto the haunting icon of the card. Therefore, unless prevented by the Taoists, a haunting ghost haunts a tile every two turns. To haunt a tile: when a ghost has reached the icon at the edge of the board, as explained above, the player must turn face down the first village tile in front of the ghost. If the first tile in front of the ghost is already haunted (face-down), then the next one on the same line gets turned face down. b : The first active village tile in front of the ghost becomes haunted. c : The player must bring a ghost into play according to the placement rules. d : The player must discard all his Tao tokens. e : The Taoist loses one Qi token. If all 3 ghost spaces on his board are occupied at the beginning of his turn, the player loses 1 Qi token and does not perform Step 3. (he does not draw a new ghost from the deck and directly starts the Yang phase). A Red, Green , Blue, or Yellow ghost must be placed on the board of the corresponding color, if possible. If all three spaces on that specific board are already occupied, then the active player chooses any other location. A Black ghost must be placed on the active player's board, if possible. Again, if the three spaces are already occupied, the active player chooses any other location. The abilities indicated in the left stone are applied as soon as the location is chosen. It might happen that the 12 spaces are already occupied by ghosts when the player must draw a new one. In such situation, instead of adding the ghost, the active Taoist loses 1 Qi token. Example: Bruce draws Severed Heads (ILLU), and as the ghost is black, he places it on his board, which brings the total number of ghosts on his board to 3. He doesn't lose any Qi token, because Qi loss due to board overrun happens in the active player Step 2, but he places one of the 3 Tao dice on Severed Heads, as indicated. However, he must also draw another ghost, but since all 12 spaces are now occupied, he loses one Qi token instead of adding another ghost. Note: The active player may use his Yin-Yang power before or after any step of his Yang phase. The player may move his Taoist figurine from its current tile to an adjacent one. Diagonal movement is allowed. Movement is not obligatory. On the tile where it stands, the Taoist may request help from the corresponding villager. The actions are detailed in the play aid. On the tile where it stands, the Taoist may exorcise a ghost situated on a adjacent space only.. Therefore, no exorcism is possible from the central tile, and two exorcisms are possible from a corner tile. To attempt an exorcism, the player rolls the 3 Tao dice. To succeed, he must obtain a number of the right colored side (the color of the ghost) at least equal to the ghost resistance. Note: white faces may replace any color, up to the player. If the player succeeds, the g host is exorcised (returns to hell), and the ghost card is discarded. If the player fails, nothing happens. Example: The yellow Taoist, played by Bruce, is combating against Bleeding Eyes (Red, resistance 2). In order to beat it and send it back to hell, he needs to obtain 2 red (or white) sides out of the 5 Tao dice. If the player does not succeed with only the dice, he may spend Tao tokens of the corresponding color to match the ghost resistance and beat it. Example: Bruce rolls the Tao dice, and gets one red side only. If he has a red token, he may spend it to send Bleeding eyes to hell. A Taoist standing on one of the four corner tiles may target two adjacent spaces, hence have the opportunity to exorcise two ghosts. For that, the player must defeat the two ghosts with one dice roll. As usual, the player may use Tao tokens to complete. When dice and Tao tokens combination allows the player to exorcise either of the two ghosts, the player may choose which of the two ghost cards is discarded. Example: The yellow Taoist is currently on a comer tile. The two adjacent spaces are occupied by Bleeding Eyes (Red, resistance 2) and Perfidious Nymph (Blue, resistance 1). The player rolls the 5 Tao Dice and gets 1 red side, 1 white side, and 1 yellow side. The yellow side is useless. He spends a Red Tao token, which is added to the red side, and exorcises Bleeding Eyes. He uses the white side as blue to exorcise the Perfidious Nymph. Special note: A player is never obliged to spend Tao tokens, but if the dice are sufficient to exorcise a ghost, the player must exorcise it. Example: Bruce is on a corner tile. The adjacent spaces are occupied by a Zombie (Yellow, resistance 2) and a Coffin Breaker (Yellow, resistance 1). Bruce wants to exorcise the Coffin Breaker because it nullifies the power of the board on which it stands. He rolls the 5 dice and gets 2 yellow sides and 1 white. Therefore, he exorcises the Coffin Breaker and the Zombie too. In addition, because of the Zombie's ability, triggered upon exorcism, he must roll a Curse die. During an exorcism, the active player may use Tao tokens of one or more Taoists at the condition that they stand on the same village tile as him. In no other case are players allowed to either give or exchange Tao tokens. Example: Bruce moves his red Taoist to the same tile as the yellow Taoist. The space in front of this tile is occupied by a Hopping Vampire (Yellow, resistance 3). Bruce rolls the 3 Tao dice, and gets one green side, one yellow side, and one red side. Bruce has no yellow Tao token, but Sam, the yellow Taoist, has 2 of them. The players choose to spend them in order to get a total of 3 yellow points and send the Ghost to the discard pile. Certain ghosts curse and/or reward the Taoist who has just exorcised them. These curses and rewards are indicated on the right stone of the ghost card. The most frequent curse is to have to roll the curse die and apply its effects. The potential rewards are as follows: Gain Tao tokens (the player chooses the color from those available in the supply), gain a Qi token, or recover the Yin-Yang token (if the player had already spent it). Curses are always applied before rewards. /Example: Bruce has just succeeded in exorcising a Dark Wraith (Black, resistance 3). He has the choice between gaining 1 Qi token or taking his YinYang back. He chooses to take back his Yin-Yang, rather than to gain Qi. A player who obtained a Buddha figurine during a previous turn (via the Buddhist Temple village tile) may place it at the end of his turn, if his Taoist faces an empty ghost space. Place the Buddha figurine on the Buddha symbol. It may be possible to place two Buddha's in the same turn, when the Taoist stands on a corner tile and the two corresponding ghost spaces are free. As soon as a ghost is placed onto a space protected by a Buddha (it van be brought here through the "pavilion of the heavenly winds" tile), it is immediately transferred to hell (the discard pile). This ghost has no time to apply any of its potential abilities, neither those on the left stone nor those on the right stone (curses and rewards). The Buddha figurine is then placed back on the Buddhist Temple tile. Each Taoist has one particularly valuable asset: the Yin-Yang. Using his Yin-Yang allows the Taoist to get help from any villager without having to be on that villager's tile, OR it allows the Taoist to turn a haunted tile back to its active side, bringing the villager back. Using the Yin-Yang is in addition to the normal action of the player. When a player uses his Yin-Yang, he puts the token in the supply. The Taoists may have the opportunity to get their Yin-Yang back by exorcising certain ghosts. The active player may use his Yin-Yang before or after any step of the Yang phase (before doing anything, after moving, etc)., but not in the middle of an action. Taoists may use their Ying-Yang twice in the same turn in certain circumstances: indeed, the player may lose his Ying-Yang, regain it thanks to a reward, and use it again immediately. Example: Sam is face-to-face with a Dark Wraith (Black, resistance 5). He has no Nack Tao tokens and absolutely wants to exorcise this ghost. He decides to use his Yin-Yang. He uses it to appeal to the Circle of Prayer tile, andplaces a Nack Tao token on it. He continues his turn and attempts to exorcise the Phantom. He rolls the 5 Tao Dice and gets one Nack side, one white side, and one green side. With the Nack token on the Circle of Prayer weakening Nack ghosts, the white side and the Nack side, the exorcism is successful. A Taoist who has no more Qi is dead. All his belongings are lost (his Tao tokens, his Buddha figurines, his Yin-Yang, his power tokens). The corresponding figurine is placed lying on the Cemetery tile. The ghosts on his board remain in play. A player whose Taoist is dead continues to play and deliberate with the other Taoists (although he cannot act directly, they still can consult his spirit, benefiting from the wisdom of the departed). He can win the game, even if dead. He may even come back to life, with the aid of the Cemetery tile (and the other Taoists!). His board becomes possessed (see neutral board below) and the ghosts occupying it continue to act, despite the Taoist's death. The steps 1 & 2 of the Yin phase must be played. The other players will have to suffer the effects and consequences of the ghosts on this board. Example: 2 village tiles are already haunted. During the next Yin phase, one more tile will be haunted by a ghost with the Haunter ability. Sam only has one Qi left, but in order to save the village, he decides to sacrifice his Taoist by requesting help from the sorcerer and send the ghost to hell. An incarnation of Wu-Feng comes into play almost at the end of the deck. 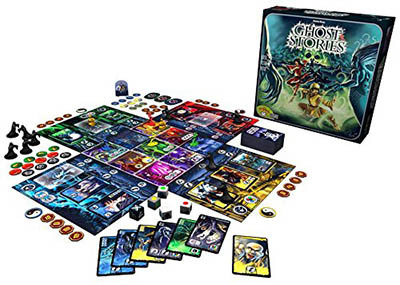 The card is placed on a player's board as for a common ghost (the "Nameless" and "Hope killer" incarnations are considered as black ghosts). Exorcising this incarnation is the only way for the players to win the game. Each incarnation has not only an ability, but also conditions that must be met to win. Incarnations are not affected by the Sorcerer's hut and by buddhas. An incarnation that comes into play on a space occupied by a Buddha is not eliminated, but the Buddha, however, is placed back onto the "Buddhist Temple" tile. Any exorcised incarnation affords 1 Qi token and 1 Yin-Yang token to the group. The players decide to whom they assign these rewards. A dead Taoist cannot receive a Qi token or a Ying-Yang token. In both the Initiation and normal levels, such reward only impacts on the final score, since the game ends up immediately when the unique incarnation is exorcised. In the nightmare and hell levels, such reward is extremely profitable for the group to go on. The players collectively win if they manage to exorcise the incarnation of Wu-Feng. Remark: Even if the last incarnation is sent to hell, the players still have to suffer any associated curse. They only win if the application of this curse does not induce their defeat. Remarks: Do not despair if your first few games result in defeat. 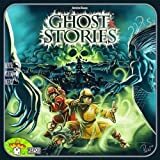 Ghost Stories requires some learning, and you may need several tries before you win for the first time. Actually, the "Hell" level of play will challenge even experienced players, but it remains possible for them to win. Just be sure to apply all the rules, use all the powers and Yin-Yang in your possession, and above all, cooperate with each other. You can do it! If the Initiation mode is still too tough, you may start with 5 Qi token. In order to evaluate your performance and to help you progress, you will find a score sheet in the box to keep track of your games. +20 points for a victory in Hell level. -1 point per card if you have lost the game.